Being an artist isn’t as hard as it looks. At least, you’re convinced it’s a shortcut to the good life. Fancy parties, wine and cheese, fame and fortune in New York. You just need to find a gallery owner who’s willing to take your counterfeit paintings at a discounted price. But can you pass among the art world’s elite? A Fake Artist Goes to New York is a drawing and social deduction party game for five to ten players. 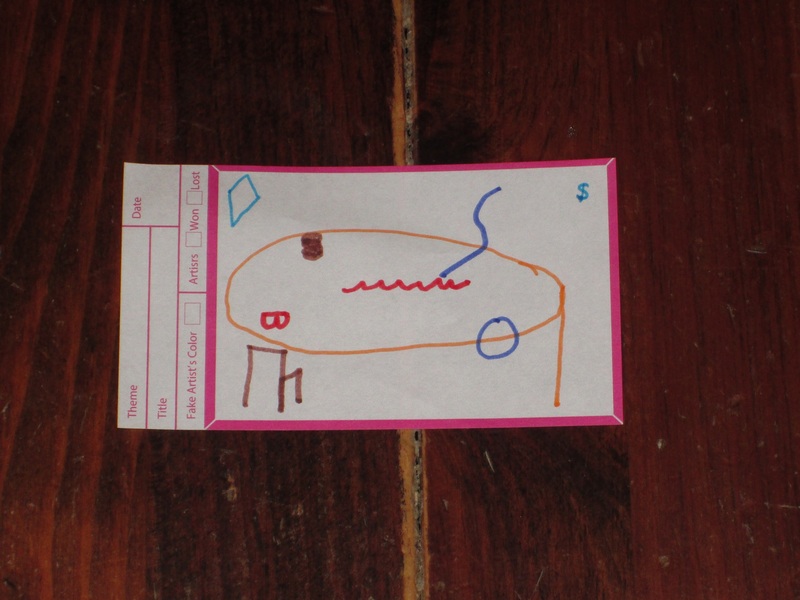 Players collectively draw a picture that the gallerist chooses, but one player doesn’t know what is being drawn. The real artists win if they identify the fake artist; the fake artist and gallerist win if the fake artist goes undetected (or is able to guess what the drawing is). 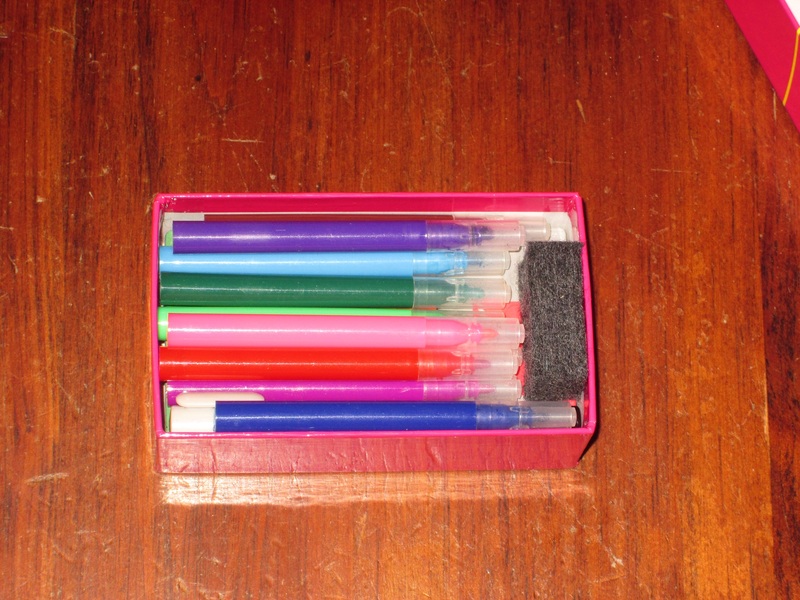 To begin, each player chooses a color of pen. One player is the gallerist and is given the dry erase marker and clue tags. The pad of paper is placed in the central playing area. 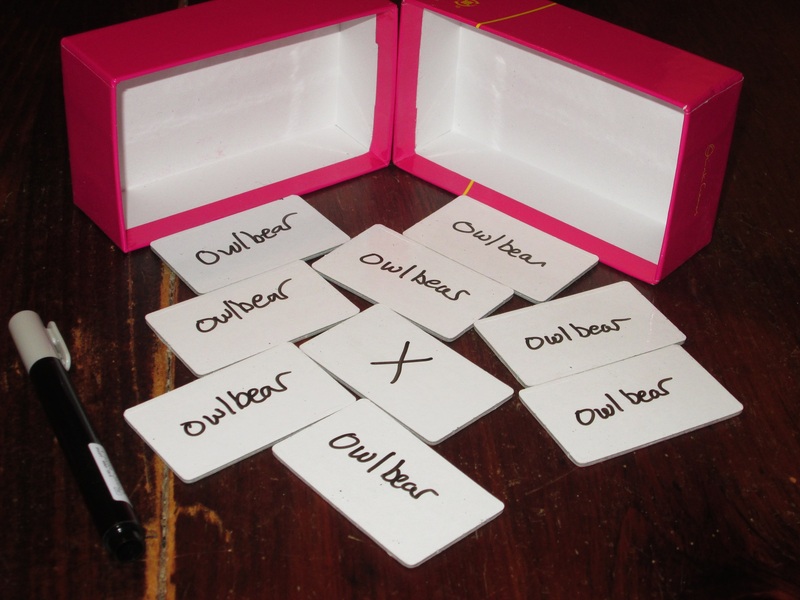 The gallerist secretly writes a word on one tag per player, except on one tag, the gallerist writes an X. 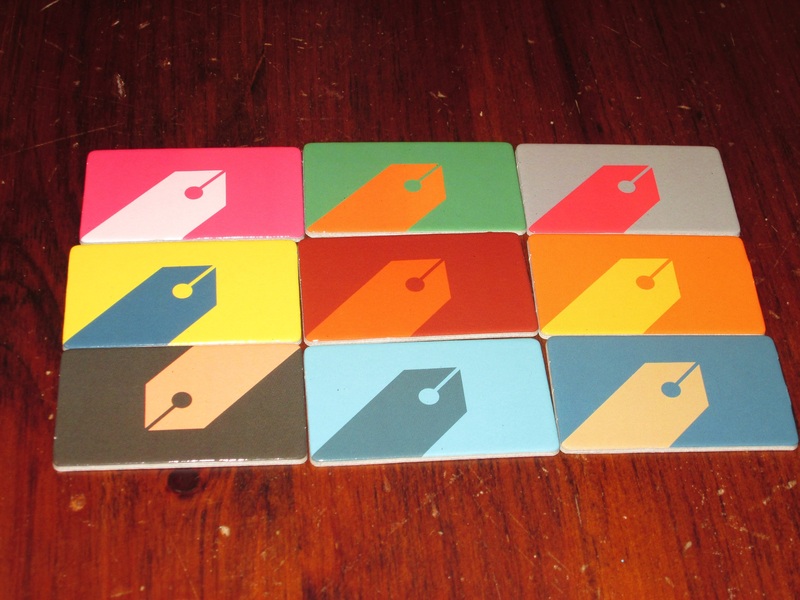 The gallerist writes a clue on all the tags but one. The X is the fake artist. The gallerist then passes the tags out to the other players, either deliberately or randomly, and names a category for the clue. The gallerist chooses a start player, and in turn order, each player makes one mark on the drawing. Then in turn order each player makes a second mark on the drawing. Once all players have made two marks on the drawing, players vote (based on the marks players have made) on which player they think is the fake artist. If the majority chooses a player who isn’t the fake artist, the fake artist and gallerist win. If the majority chooses the fake artist but the fake artist is able to guess the clue that the players were drawing, again, the fake artist and gallerist win. If the players correctly identify the fake artist and the fake artist can’t guess the drawing, the real artists win. The Real McCoy, or a Crummy Copy? 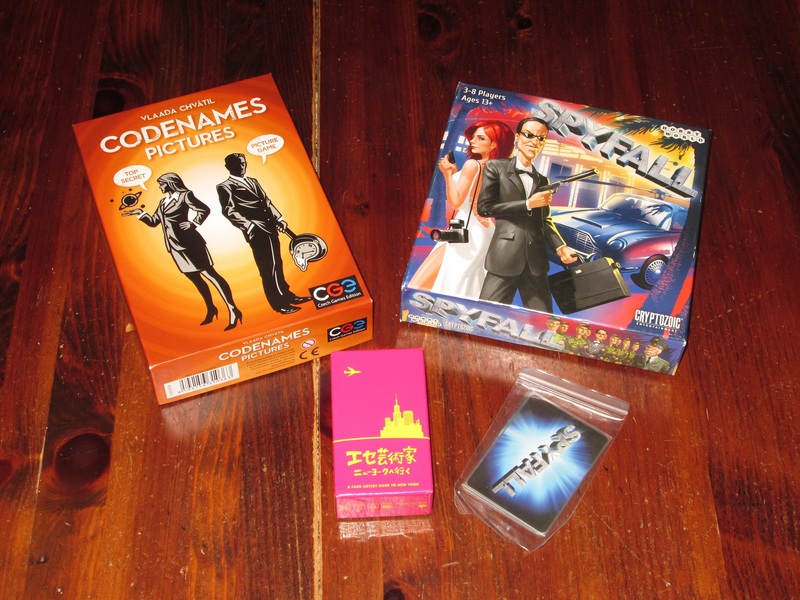 2015 was the year of the party game for me, with Codenames, Mysterium, and Spyfall all appearing on my radar (and in my collection). But Spyfall was (and remains) my favorite of the bunch. There’s just one problem: getting people to play Spyfall is very hard these days. The reason is that being the spy is just so stressful, so even when someone is the spy only once or twice in an evening, that is all they can remember the next time I suggest the game. It takes a long time for this feeling to wear off, and even then there looms a secret dread that they might be dealt the spy card again. A Fake Artist Goes to New York uses a similar hook to Spyfall–one player doesn’t know what everyone else knows and has to fake it–but it attaches it to a drawing game. The result is a game that, while not quite as good as Spyfall, delivers much of the same fun with only a fraction of the angst. 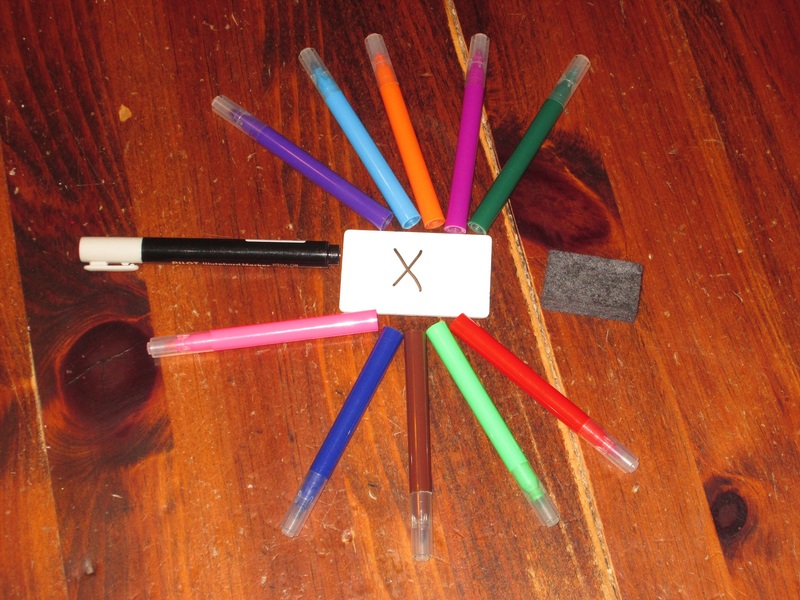 Each player receives a different color pen so it’s easy to tell who drew what at the end of the round. There are several reasons for the reduced stress of A Fake Artist Goes to New York, and most of them are related to the drawing aspect of the game. The fake artist needn’t look other players in the eye, or even to speak at all. The fake artist just has to make a mark on the paper. After this is done, the stress is over, and the chatter at the table isn’t always (or even often) about what’s on the page. But more than this, while most people are fairly competent at talking, such that any hesitation in giving an answer in Spyfall can be taken as caginess, drawing is something that most people claim to be bad at, and the evidence often bears out that claim. Now, for most drawing games, skill isn’t necessarily rewarded. My mom is a much better artist than I am, and this is her downfall in Pictionary–the goal is to communicate the clue as quickly as possible, which is a different goal than having a hang-worthy picture at the end. And the same is true here. But people are usually bad enough at drawing that it is easier to blend in, or at least to feel less awkward about not blending in, here than in Spyfall. One of these tags is not like the others… Could it be the fake artist’s? And the result is a game that stills allows a lot of laughs. Similar to Dixit, players have to avoid the twin ditches of revealing too much and revealing too little. If the mark seems to be simple symmetry, just copying what another player is doing, that is a dead giveaway for the fake artist–or is it? Even though other games have honed this tightrope before, A Fake Artist Goes to New York feels like a fresh concept because of the drawing. We’ve seen social deduction before, but never quite like this. And because the task is difficult and novel and because there is the shared goal of teams, the game remains consistently fun, no matter what role you’re playing. Admittedly, this isn’t great art. The category for this drawing was “at the zoo,” and the clue was “monkeys.” The task given to the real artists was to draw monkeys in such a way that we knew what each player was doing but to make it obscure enough that the fake artist would have no idea. This is hard to do, because it behooves the gallerist to choose an easy clue. As you can see, each player’s marks are color coded, so it’s easy to tell at the end of the round who drew what. There are lots of trees, a subtle monkey-looking child looking over the balcony at the monkey area, and a bed (which I later learned was for “No More Monkeys Jumping on the Bed”). For my two marks, I drew a tree and a guitar. At one point in the round, the fake artist said, “A guitar? What, for like, ‘Hey, hey, we’re the Monkees’?” There was nervous laughter all around the table. 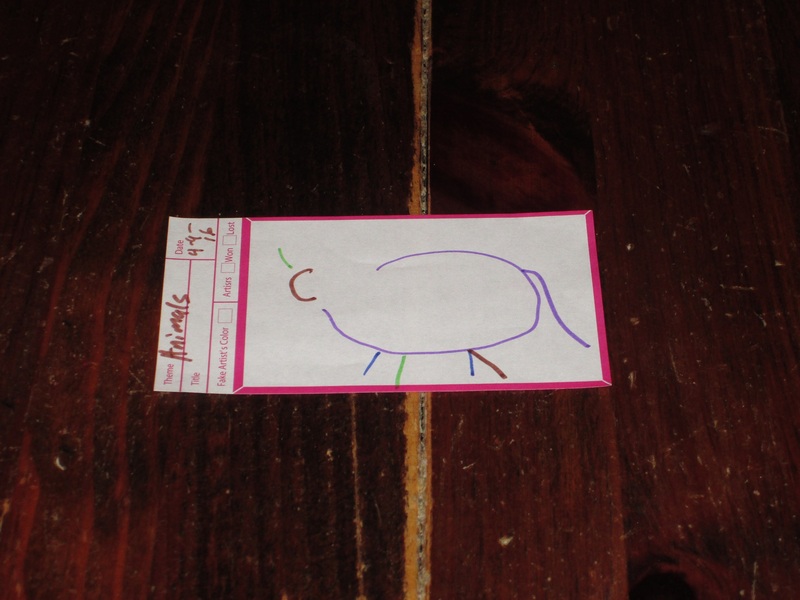 Once all the players had made their marks, we voted on the Monkees guy as the fake artist–his marks are the brown ones, and we realized those could be anywhere at the zoo–and we all had a big laugh when he had no idea what we had drawn, despite his earlier insight and mild promptings from the gallerist. It’s moments like these that make the game excellent, and the game is well-enough designed that these moments are plentiful. The category here was “music.” Can you guess the clue? However, there are some weaknesses of A Fake Artist Goes to New York. For one, like most party games, it’s only as good as the players playing it. If players don’t get (or can’t think of a way to articulate) the central idea–you have to draw so obscurely that it can’t be discovered by an outsider but so clearly that an insider knows you’re one of them–the game can fall into a familiar (and boring) rhythm quickly. The first round of the game can sometimes be like this especially as players aren’t quite sure what they’re getting into. It usually improves with a little practice. The category was “pastime.” And the clue is…? This leads into the biggest problem I have with the game: it’s a little too easy to play as the fake artist. Even if a player is outed as the artist, the artist gets a guess at the picture, and often the artist can win on blending in or especially the guessing. Just as Spyfall feels weighted toward the “insiders,” A Fake Artist seems weighted toward the fake artist/gallerist pair, since the clue is intentionally easy and it doesn’t take much to completely give a clue away if one of the real artists isn’t careful. This easiness can sometimes make A Fake Artist feel more like an activity rather than a game. But this is also what makes a real artists win so special. Since it doesn’t happen often, each one feels earned. And each game is memorable enough that just by looking at past drawings, I’m able to recall what that round was like. 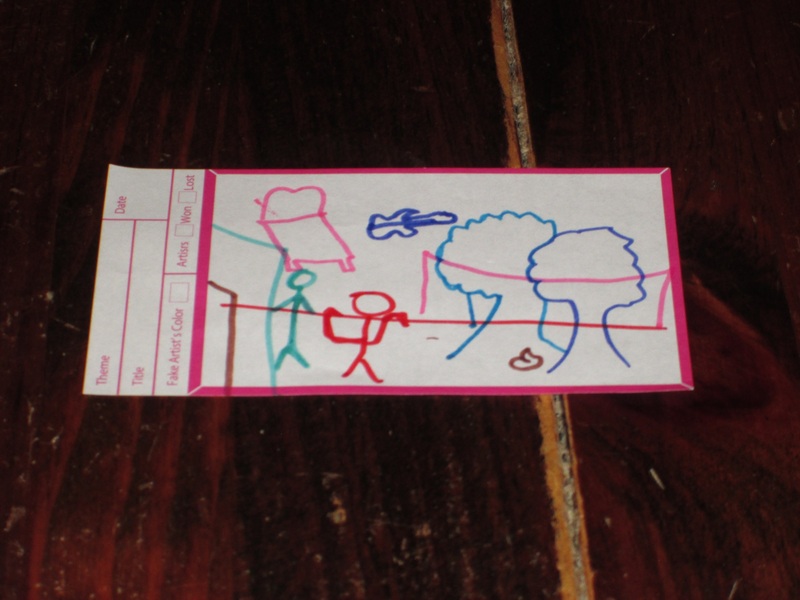 Many party games might have a few memorable moments like these, but A Fake Artist Goes to New York–especially with its “souvenir” paper–is a fun memory factory. Everything for the game fits in a compact box. Wonderful. The components of the game are excellent for what they are. The dry erase marker and tag boards are a great way to offer endless possibilities and unlimited use (at least until the marker dries up, but even then, it’s easily replaced). I’ve played the game 30+ times in the last year, in addition to the games that have been played when I loaned it out, and I haven’t even come close to exhausting the paper supply, even using each paper just once. 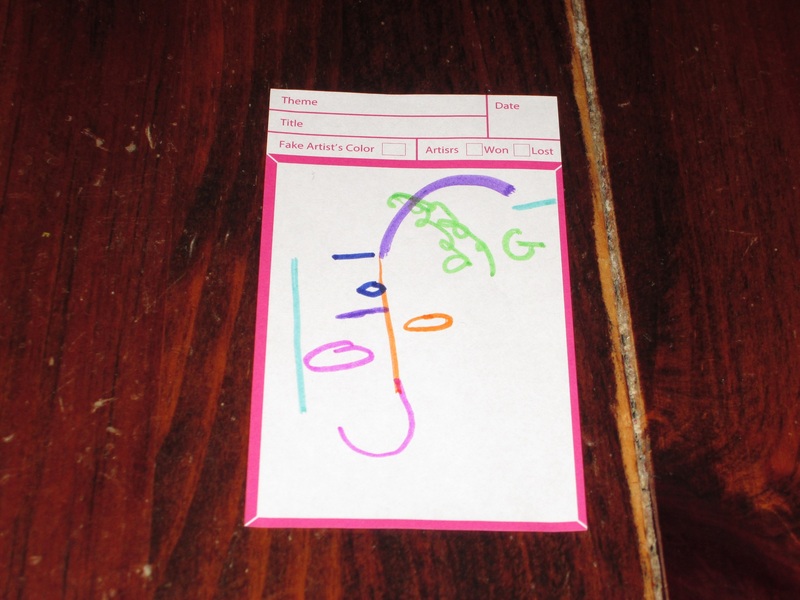 The colored markers are an excellent touch–they make identifying which player drew which mark easy at the end of the round, although some of the colors are similar enough that some players still have to fess up to what they drew. You can fit this in just about any bag with room to spare, and it doesn’t feel like a gimmicky micro game. It feels like a legitimate game that just happens to be tiny. LOVE IT. But far and away my favorite thing about A Fake Artist Goes to New York’s components is how compact it is. Yeah, I know, it’s a tiny box that runs $22 new. That can be a hard pill to swallow for some, but it is such a boon to have a game that accommodates so many players, is so easy to teach and play, and offers this many laughs while also being small enough that you can always have it with you. Codenames and Spyfall are decently portable, but they’re large enough that someone has to request them or I have to have a specific plan in mind in order to bring them along. 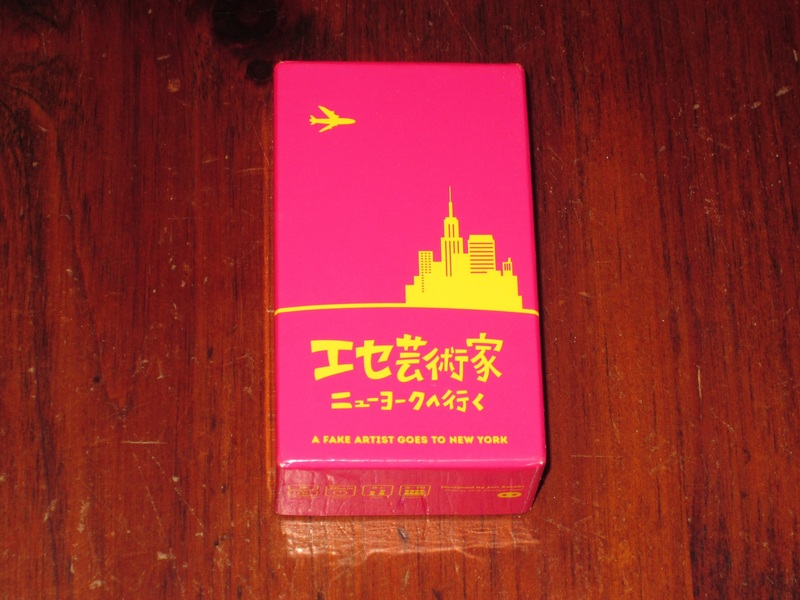 A Fake Artist Goes to New York is the kind of game I just always keep in my bag, and there have been numerous times when I’ve needed a 5-10 player game and have been grateful to have such a good one so close at hand. Uh, this is a rhino. Obviously. A Fake Artist goes to New York is an excellent party game, whether your group likes drawing games or Spyfall or not. It’s a consistent source of fun that even a big group can participate in. It’s fast, it’s simple to teach, and best of all, its tiny box makes it extremely portable–this really is a game you can have on hand just about anywhere. Obviously, party games are group dependent, and this may not be a great fit for some groups. But I’m having trouble thinking of many groups who won’t fall in love with making counterfeit drawings. Nice review. Spyfall was a game for our group that burned brightly and fizzled out really quick. I think it lasted only a few months before no one wanted to play it anymore. This might be a fun replacement. Thankfully, I still get to play it, it’s just limited to certain groups who are willing to be the spy. I still think Spyfall is the better game, but this is a great alternative that won’t burn people out as quickly. Why is Spyfall in such a big box anyway? It’s been ages since I’ve played it but I can’t think of what’s in there such that it needs it. I don’t begrudge Spyfall its bigger box. My box, at least, is pretty packed, but I sleeved my cards.